A while back I heard about a wine called MV, named after Jean-Georges' wife, Marja. As it turns out, this wine is made exclusively for the Jean-Georges restaurants. 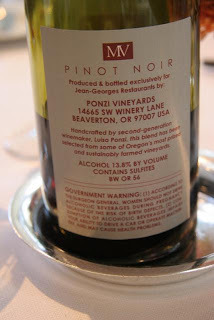 This pinot noir is grown and bottled in Oregon at the Ponzi Vineyards. I wish I had more information on the wine, but since it's bottled only for the JG restos, there is not much press on it. 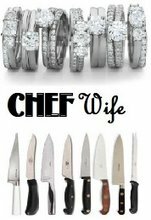 If Jean-Georges or Marja are reading this, please email me! I've heard this wine is fantastic and I wish I could get my hands on some. I wouldn't mind having my initials on a bottle of delicious pinot noir. Actually I prefer something white. By the way, I know NOTHING about wines. I wish I did but it seems so overwhelming. I thought about taking a class at the FCI, but again I get so nervous that I won't be able to contain all the wine knowledge in my little head, let alone tell the difference between grapes and regions. 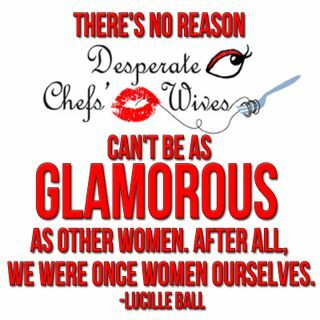 Though, it feels like my "duty" as a chef's wife to know all I can about dining, which includes wine. 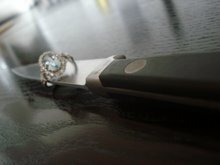 Hmm, maybe I'll start with etiquette classes. I could handle that. Some of the wine shops around the city offer fun introductory classes - that could be a good place to start. I know that they have something in the Chelsea Market once a month or so, and the Chelsea Wine Vault has informative tastings every week (if not more often). Morrell in Rockefeller Plaza has basic introductory classes as well as classes more specific to each region/grape. Otto's classes are great, because they usually have food (yes, my heart is in my stomach), but they focus on Italian wines only. If you pair some very basic knowledge with lots and lots of wine-drinking to find what you like, you'll look like you know what you're doing with a wine list when you're out to dinner. I'm at perrystreet right now sipping on some MV wine and it is very tasty. I don't even know the right adjectives to describe it, so bright? Does that work? Also the music here is kicking! Upbeat yet classy this is the place to be. But don't take my word for it, I'm biased.